For over a half century, American manufacturing has dominated the globe. It turned the tide in World War ii and hastened the defeat of Nazi Germany; it subsequently helped rebuild Europe and Japan; it enabled the United States to outlast the Soviet empire in the Cold War. At the same time, it met all the material needs of the American people. During this period, many American icons were born. Companies like General Motors, Ford, Boeing, Maytag and Levi Strauss became household names. American manufacturing became synonymous with quality and ingenuity. On the back of this industrial output rose America’s middle class. High-paying manufacturing jobs, in turn, helped spur a robust and growing economy that depended little on foreign nations for manufactured goods and armaments. Considering the stupendous list of America’s manufacturing achievements and the vulnerabilities associated with foreign dependence when a nation lacks strong domestic manufacturing, it is alarming when economists are warning that the U.S. is facing the “gutting, hollowing out and closing down of American manufacturing forever” (Benson’s Economic & Market Trends, Feb. 27, 2004). The loss of the manufacturing industry manifests itself most clearly in job losses. According to the Economist, “For the first time since the Industrial Revolution, fewer than 10 percent of American workers are now employed in manufacturing” (Oct. 1, 2005). But even this figure is probably double the actual percentage, because many workers in a typical manufacturing firm have service-type jobs. In comparison, during the 1970s, approximately 25 percent of American workers were employed in manufacturing. From 1990 to present, manufacturing jobs have decreased every single year; since 1996, they have plummeted by almost one fifth. Most recently, these job losses and the hollowing out of American manufacturing have been evidenced in the auto industry. On Nov. 21, 2005, General Motors Corporation (gm) announced plans to cut 30,000 jobs and close nine manufacturing plants across North America. According to its ceo, the decision represented an attempt to “get its costs in line with major global competitors” and “return North American operations to profitability as soon as possible” (Associated Press, Nov. 21, 2005). Following these cuts, gm will have laid off 40 percent of its white-collar staff since 2000. In a reflection of the resultant loss of confidence in the company, last May gm’s debt (sold as bonds) was downgraded by s&p from investment grade to the highest level of junk status; in September, it was downgraded even further. Now it is five steps below investment grade. Analysts even recommend sellinggm stock, with one Bank of America Securities analyst saying it was “inevitable” that gm would eventually seek bankruptcy protection (cnn/Money, Dec. 16, 2005). gm’s layoffs exclude the cuts announced by former gm-owned auto parts maker Delphi, which filed for bankruptcy protection last October. In 1999, Delphi laid off 18,000 workers. Now it is reportedly seeking to cut two thirds of its 34,000 hourly workers and slash hourly wages from as much as $30 per hour to as little as $10. Ford, another American icon, has been slashing jobs too. According to Forbes, Ford could cut up to 30,000 jobs and close 10 plants (Dec. 7, 2005). Egan-Jones Ratings Co., an independent firm, is predicting that “[t]his is the beginning of the end of the U.S. auto industry as most people have come to know it” (TheStreet.com, May 5, 2005). However, the auto industry is just one example of the overall decline in American industrial might over the past couple of decades. Other U.S. manufacturing giants are failing, too; in fact, the U.S. has lost 3 million manufacturing jobs just since 1998. In 2003, industrial giant Bethlehem Steel folded, causing thousands of employees and retirees to lose their pensions. Any Pittsburgh resident would be able to tell you how unprofitable the steel industry has been over the last 20 or so years. Between 1950 and 2000, the U.S. lost more than 491,000 jobs from the primary metals industry alone—most of those after 1980; from 2000 to 2003, an additional 149,000 of these jobs vaporized. In 2004, Levi Strauss closed the last of its more than 60 American factories. “It was like a death in the family,” said Emma Rice, of Morrilton, Arkansas, who worked for Levi Strauss for 32 years (Times, London, Jan. 10, 2004). Unfortunately, the former Levi-employed majority of Morrilton tell the same tale as those from thousands of towns across America that have also experienced the loss of manufacturing jobs. Manufacturing loss is occurring because of globalization and outsourcing. Globalization is the increased mobility of goods, services, labor, technology and capital throughout the world; outsourcing is the performance of a production activity in another country that was previously done by a domestic firm or plant. At the dawn of globalization, the elimination of trade barriers opened up access to foreign markets for American manufacturers in return for building factories abroad. In due course, more and more manufacturers set up shop overseas, producing goods to be sold to Americans. Today, the trend is so severe, analysts predict that in some industries, a quarter to a half of all jobs are likely to migrate (Daily Reckoning, Aug. 5, 2005). With the birth of the North American Free Trade Agreement in 1994, Mexico became a major recipient of outsourced U.S. manufacturing jobs. 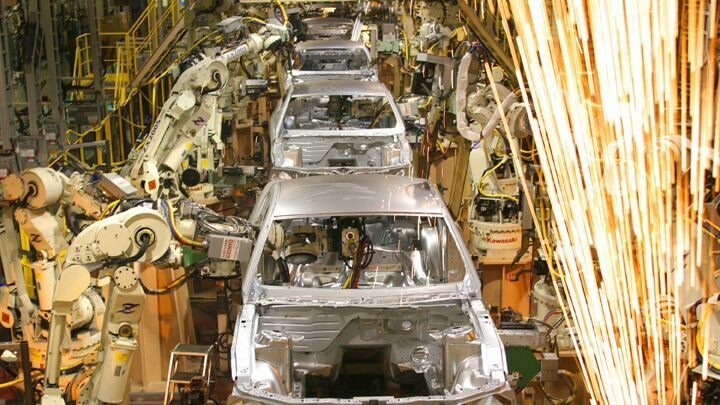 Mexico is now a global leader in auto parts manufacturing and one of the world’s largest tv set producers. Now, with the startup of the Central American Free Trade Area (cafta) this January, analysts are anticipating another exodus of U.S. jobs to south of the border. U.S. household names such as Dell, ibm, Sara Lee/Hanes and Maytag have already been moving business into the Central American region. Asia has also been a long-time recipient of outsourced American manufacturing. A study by the universities of Cornell and Massachusetts-Amherst found that India alone may be responsible for up to 700,000 outsourced jobs. China has also received hundreds of thousands of outsourced jobs. Admirers of globalization contend that freer access to foreign markets and cheap labor increase corporate profits and thereby benefit the U.S. economy. While this argument may superficially sound compelling, it ignores the dangerous long-term effects of manufacturing losses. In reality, outsourcing makes Americans poorer over time, because America’s wealth and technology slowly migrate to other nations. In the words of the Daily Reckoning, “Historically, manufacturing, exporting and direct investment produced prosperity through income creation” (April 4, 2003). America’s wealth grew when profits from domestic manufacturing were reinvested into buildings, machinery and technological change. But now outsourcing is diverting that income to foreigners. America may gain access to cheaper products through outsourcing, but it also comes with attendant problems, including a downward pressure on wages. Laid-off manufacturing laborers are largely switching into lower-paying jobs in the service industry. Where they once made an average of $51,000 annually, they now make $16,000 in leisure and hospitality, $33,000 in health care, or $39,000 in construction (Seattle Times, op. cit). In 2004, average employee compensation in the U.S. fell for the first time in 14 years. If America does not manufacture and sell goods, then money only leaves the country. The U.S. now imports twice as much as it exports. This has resulted in a trade deficit that has ballooned to an unprecedented $800 billion on an annualized basis. Unfortunately, this trend shows no signs of abating. U.S. exports are declining versus imports all across the board. Even agriculture posted a deficit this past year for the first time in living memory. Every time an American manufacturer closes and then reopens elsewhere, the foreign country gains American technology. Not having to spend resources developing technology, foreigners can focus on improving or beating it. Many developing nations, especially China and India, are notorious for their lack of intellectual and technological property rights. According to David Pritchard, a research associate at State University of New York, American companies are hastening their demise by sharing valuable technology with foreign governments intent on setting up their own industries. This is exactly what is happening with aircraft manufacturer Boeing, which has been outsourcing labor in China, Japan and other countries. Globalization admirers contend that because the work forces of developing nations are unskilled, they cannot compete with the U.S.; thus, only low-end, low-skill jobs are lost to outsourcing. However, this is not true. The Asian workforce, in particular, has made huge strides. According to Fortune magazine, in the next year China will produce 3.3 million university graduates, all of whom speak English. India too will turn out 3.1 million English-speaking graduates. Furthermore, in engineering alone “China’s graduates will number over 600,000, India’s 350,000, America’s only about 70,000” (July 25, 2005). These graduates are beginning to fill more than just low-end, low-skill jobs. Regarding the effect of this labor shift on manufacturing, economist Richard Benson relates that whether you build a factory here or in China, the factory will be the same and the workers will have similar skills, but the main difference is that “the Chinese will work seven days a week for us$0.50 to us$1 an hour with no benefits for social security, health care, vacations, a pension or worker safety. … In America, the going wage would be 10 to 20 times higher including all benefits” (Benson’s Economic & Market Trends, op. cit.). It’s not hard to see why, in order to reduce costs, manufacturing businesses have been abandoning America in droves and fleeing to Asia. Many Americans did not take notice in the beginning, because it was only the low-paid manufacturing workers making toys, shoes and clothing that lost their jobs to cheap foreign competition. But next to go were the higher-paid shipbuilders and steel producers; now it is auto workers and others. Continually moving further up the value chain, the Los Angeles Times says that even highly skilled, higher-paid American workers are starting to feel the outsourcing pinch. Jobs such as engineers, computer software scientists, Hollywood animators and aerospace manufacturers are all now under threat. Take Boeing, for example. This American giant is the type of company that symbolizes the “high-tech leadership on which the future of the U.S. economy is widely said to depend” (Newsweek, Dec. 2, 2005). Yet, 20 years ago, most of its aircraft parts were manufactured domestically, while today, sadly, up to “70 percent of the airframe of the company’s next-generation 787 Dreamliner will be made overseas, including key parts such as the fuselage and wings.” Even the engine will be produced outside the U.S., while workers inside the U.S. are left with layoffs. Some economists have noticed manufacturing losses, but because the negative long-term ramifications have not become fully manifest in the economy, people are willing to turn a blind eye. Over the short term, companies have become richer through outsourcing, and consumers are happy because they have cheaper toys. But this will not last forever. At some point, manufacturing job losses will mean Americans will not be able to afford toys at all. What does the decline in manufacturing mean for the average American? First, America as a whole will eventually become poorer, so be prepared to downgrade your standard of living. As progressively more manufacturers move abroad, the flow of money out of the country will exceed the benefits of cheap imports. At some point, America’s trade deficit will overwhelm us. If this trend continues, eventually Americans will not be producing enough to pay for the standard of living that post-World War ii America has become used to. Jerry Roy is a 49-year-old family man from Michigan who has worked for gm since 1977. According to the New York Times, when Jerry was first hired, he said it was like “I’d died and went to heaven.” Such was the promise of manufacturing being a secure path to the American dream (Nov. 19, 2005). Actually, four generations of Roys have worked for gm. Jerry’s great-grandfather first started at a gm Delco plant during the Great Depression. Then Jerry’s grandfather worked at the same plant during the war years when it was converted over to a machine gun factory. Jerry’s father, mother, an aunt and a great uncle all worked for gm, too. Jerry’s father, Gerald, recalled the stark contrast between the now-closed plants and the “golden” era when production levels were so high shifts worked around the clock, never shutting down. Jerry, too, described in amazement all the empty parking lots that used to be factories (ibid.). Now, Jerry, who is currently working for former gm parts unit Delphi, is facing either a major wage cut or a layoff—as are thousands of others like him. “The days when blue-collar work could be passed on down the family line … those days are over,” said one professor of labor relations at Clark University in Massachusetts (ibid.). By building factories overseas, manufacturers are sowing the seeds of their own long-term destruction by slowly reducing the wealth of Americans—their primary customers. Be warned—and remember the old adage: As gm goes, so goes the nation.